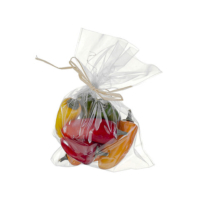 You must add a minimum of 6 9 Inch x 7 Inch Faux Peppers Assortment In Bag (8 Per/Bag)'s to your cart. To make your foods spicy and delicious pepper is the one ingredient that you must add to your foodstuff. Same as to make your kitchen looking great you need to add pepper to your kitchen’s decoration. The original looking artificial pepper can add a great organic touch to your kitchen or dinner table. As the pepper comes in both colors red and green, so we have made our peppers in the same colors to look very original. You can put them in your decorative vegetable collection to add a unique and spicy touch to your dining table. These plastic pepper can be used for different locations like market decor, party decor, home decor, teaching aid, game props, pillars, hanging roof decor, promotion, preschool enlightenment education, shooting props, etc. As Pepper is an integral part of your food’s spices, you must keep it in mind to decor your kitchen or dining table and our artificial peppers can help you do so.